If your household income is $55,000 or less, the KCTCC can prepare and e-file your taxes for free. NPO Showcase highlights nonprofit and government organizations that improve the quality of life in our community. The program is a feature of GRTV and the Community Media Center, with producer and host Julie Way. You can catch it on GRTV on Saturdays at 8 AM and 6 PM and can view past episodes on the Grand Rapids Community Media Center website. If your nonprofit would like to be interviewed on NPO Showcase, please contact Julie Way. 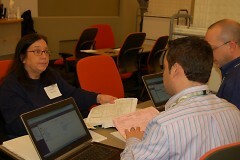 Employees at Steelcase help prepare taxes during the Community Tax Day. It's that time of the year again- tax season. Many people dread having to prepare their taxes. It can be confusing, and if you aren't aware of the different tax credits you may be eligible for, you may be passing up hundreds of dollars in credits. After reading a report put out by the Internal Revenue Service, a group of Kent County citizens and organizations came together to change that. "We realized that 11 million dollars of the Earned Income Tax Credit were going unclaimed here in Kent County each year. We wanted to find out how we could put that money back into the hands of families who have worked for this credit," says Brenda Brame, Program Manager for the Kent County Tax Credit Coalition. In 2002, the KCTCC became a program of Heart of West Michigan United Way. By partnering with the IRS to train and certify volunteers, the KCTCC is able to provide free tax preparation services at sites around the county. Even if you do not qualify for the Earned Income Tax Credit, if your total household income was $55,000 or less in 2014, you can access these services. KCTCC's work is about more than helping people file their taxes. It's also helping our local economy. "Every time you spend a dollar in our community, that means that someone else has a job," says Brame. Learn more about the KCTCC in the NPO Showcase interview above. You can also find more details on their website, or by dialing 211.